One company I’m proudly designing for is Kennard & Kennard Fabrics. There are many collections in various stages of production, keep checking for updates. The fabrics are sold into Patchwork & Quilting retail outlets across Australia. Sweet Botanicals CollectionMy first collection, available in stores now. Click to see the fabrics and a popup will appear showing the retail outlets. Sweet Botanical CollectionAvailable in stores now. Click to see the fabrics and a popup will appear showing the retail outlets. Native Blush CollectionCurrently in production, will be available soon. Retailers can pre order with Kennards - Click to view. 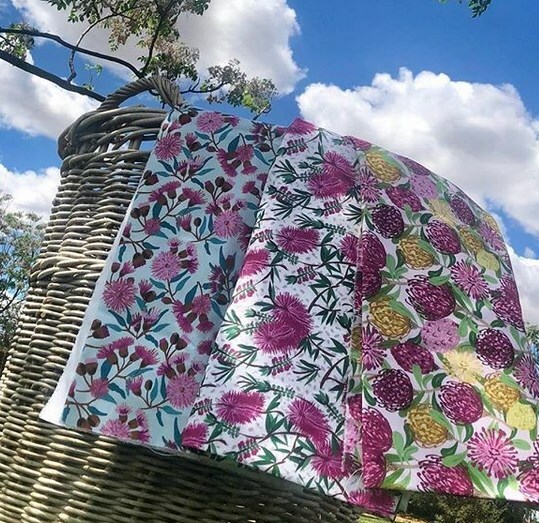 I’d love to hear from you if you are interested in my fabric designs printed on a Cotton/Linen blend which is ideal for bags, lampshades, cushions, apparel, home decor, upholstery etc. I do special orders, so please enquire.